We develop evolutionary protein design methods to elucidate principles of biological design and generate novel and useful enzymes and organisms. Prospective graduate students should apply through the appropriate PhD option (ChE, BE, BMB, Chem, Bio or other). Photos from the Nobel Ceremony have made their way onto our website! Congratulations to Kai Chen for his Resnick Institute graduate fellowship! Unending congratulations to our evolutionary ringmaster, Frances Arnold, for winning the Nobel Prize in Chemistry 2018 for her pioneering work in Directed Evolution. Allison Tang has been selected as an awardee for the Future Leaders in Chemical Engineering symposium. Congratulations! Congratulations to postdoctoral fellow Dr. Xiongyi Huang on getting his NIH K99 funded!! Congratulations to Anders Knight and co, whose paper on enabling stereodivergent cyclopropanation of unactivated alkenes with diverse engineered heme proteins has been highlighted in Synfacts. Congratulations to Oliver Brandenberg and co, whose paper on the stereoselective enzymatic synthesis of heteroatom-substituted cyclopropanes has been highlighted in Synfacts. Congratulations to Kari Hernandez for receiving the 2018 CCE Teaching Assistantship Award (May 2018). Our work in evolving enzymes for stereodivergent cyclopropanation of unactivated alkenes was featured in C&EN News (Feb 2018). Congratulations to Jenny Kan, Xiongyi Huang, Yosephine Gumulya, and Kai Chen for their paper on chiral organoboranes built by bacteria (Nov 2017). Our work in forming C-Si bonds was featured in the most read story of 2017 in Astrobiology Magazine! Check out Frances’ new essay in Angewandte Chemie (open access): “Directed Evolution: Bringing New Chemistry to Life“. Congratulations to Xiongyi Huang (current postdoc): NIH Ruth L. Kirschstein NRSA postdoctoral fellowship (2017). 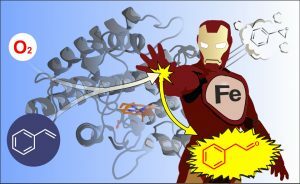 Congratulations to Stephan Hammer, Grezgorz Kubik, Ella Watkins, Shan Huang, and Hannah Minges for their paper on beating catalysts at the oxidation game. Congratulations to Anders Knight, who won the best poster award at the ECI Enzyme Engineering Conference in Toulouse, France. Congratulations to David Romney, Javier Murciano-Calles, and Jöri Wehrmüller, whose paper on synthesizing tryptophan analogues has been selected by the Editorial Board of Synfacts for its important insights as “Synfact of the Month”. Congratulations to Chris Prier and Kelly Zhang, whose paper on asymmetric C-H amination has been selected by the Editorial Board of Synfacts for its important insights as “Synfact of the Month”. Frances Arnold is the recipient of the Society of Women Engineers’ 2017 Achievement award. Congratulations to Kevin Yang (grad), one of the three recipients to receive the first ever CCE Teaching Assistantship Award, presented to the divison’s most exceptional teaching assistants. Congratulations to Kari Hernandez (grad), the 2016 winner of the Constantin G. Economou Memorial Prize for outstanding candidacy research in Chemical Engineering. Congratulations to Andy Buller, who will join U. Wisconsin Chemistry.